eCite - Is there a 'business case' for board diversity? 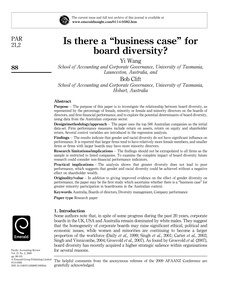 Purpose – The purpose of this paper is to investigate the relationship between board diversity, as represented by the percentage of female, minority or female and minority directors on the boards of directors, and firm financial performance, and to explore the potential determinants of board diversity, using data from the Australian corporate sector. Design/methodology/approach – The paper uses the top 500 Australian companies as the initial data-set. Firm performance measures include return on assets, return on equity and shareholder return. Several control variables are introduced in the regression analysis. Findings – The results indicate that gender and racial diversity do not have significant influence on performance. It is reported that larger firms tend to have relatively more female members, and smaller firms or firms with larger boards may have more minority directors. Research limitations/implications – The findings should not be extrapolated to all firms as the sample is restricted to listed companies. To examine the complete impact of board diversity future research could consider non-financial performance indicators. Practical implications – The analysis shows that greater diversity does not lead to poor performance, which suggests that gender and racial diversity could be achieved without a negative effect on shareholder wealth. Originality/value – In addition to giving improved evidence on the effect of gender diversity on performance, the paper may be the first study which ascertains whether there is a "business case" for greater minority participation in boardrooms in the Australian context.